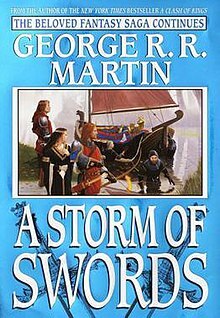 A Storm of Swords is the third of seven planned novels in A Song of Ice and Fire, a fantasy series by American author George R. R. Martin. It was first published on August 8, 2000, in the United Kingdom, with a United States edition following in November 2000. Its publication was preceded by a novella called Path of the Dragon, which collects some of the Daenerys Targaryen chapters from the novel into a single book. At the time of its publication, A Storm of Swords was the longest novel in the series. It was so long that in the UK, Australia, and Israel, its paperback edition was split in half, Part 1 being published as Steel and Snow in June 2001 (with the one-volume cover) and Part 2 as Blood and Gold in August 2001 (with a specially-commissioned new cover). The same division was used in the Polish and Greek editions. In France, the decision was made to cut the novel into four separate volumes. A Storm of Swords won the 2001 Locus Award, the 2002 Geffen Award for Best Novel and was nominated for the 2001 Nebula Award for Best Novel. It was the first novel in the series to be nominated for the Hugo Award, one of the two most prestigious awards in science fiction and fantasy publishing, although it lost to J. K. Rowling's novel Harry Potter and the Goblet of Fire. Meisha Merlin Publishing, which had previously issued limited, illustrated editions of both A Game of Thrones and A Clash of Kings, was planning to release a similar version for A Storm of Swords in two volumes; however, lengthy delays in the release of A Clash of Kings caused it to lose its publishing rights, which were picked up by Subterranean Press. This edition, illustrated by Charles Vess, was released in the summer of 2006. A Storm of Swords is also the name of the second expansion to the board game A Game of Thrones, released in July 2006. Approximately the first half of the novel was adapted for television as the third season of the HBO show Game of Thrones, while the second half became the basis for the series' fourth season, and some elements for the series' fifth season. "The Red Wedding" redirects here. For the television adaptation of the scene, see The Rains of Castamere. A Storm of Swords picks up the story slightly before the end of its predecessor, A Clash of Kings. The Seven Kingdoms of Westeros are still in the grip of the War of the Five Kings, wherein Joffrey Baratheon and Stannis Baratheon compete for the Iron Throne while Robb Stark and Balon Greyjoy declare their independence. Meanwhile, a large host of wildlings approach the Wall under the leadership of Mance Rayder, the self-proclaimed "King Beyond the Wall", with only the undermanned Night's Watch in opposition. Finally, Daenerys Targaryen approaches Pentos. Arya and the Hound arrive at the outskirts of the castle as the Red Wedding is taking place; to keep her from running inside to her death, the Hound knocks Arya unconscious and takes her downriver. As she sleeps, Arya sees through the eyes of her long-missing direwolf, Nymeria, that her mother Catelyn is dead, the direwolf pulling Catelyn's body from the river. Arya and the Hound encounter Gregor Clegane's men, by whom the Hound is wounded. His wound becomes infected, and Arya abandons him. She finds a ship from the Free City of Braavos and asks for passage to Eastwatch, but the captain refuses her passage until she offers him the coin and password "Valar Morghulis", given to her by Jaqen H'ghar. The captain replies "Valar Dohaeris", and they set sail. In the epilogue, a re-animated but decayed and mutilated Catelyn is leading the Brotherhood Without Banners, and she oversees the lynching of two Freys present at the Red Wedding. After the Battle of the Blackwater, Davos Seaworth is taken to Dragonstone by men loyal to King Stannis. Stannis survived the Blackwater due to Rolland Storm commanding his rearguard and enabling him to escape to the fleet. Davos blames the red priestess Melisandre for Stannis's defeat and the deaths of his four eldest sons, and is imprisoned for treason (Melisandre having foreseen his intention to assassinate her). At Melisandre's behest, Stannis releases Davos and asks him to serve as his Hand. Stannis' previous Hand, his wife's uncle Lord Alester Florent, tried to make terms with the Lannisters behind Stannis' back, and has thus been arrested. With Stannis' cooperation, Melisandre has performed rituals to awaken "stone dragons", which she identifies as the great statues adjacent to the castle. King's Landing welcomes the Tyrells as liberators, and King Joffrey sets aside his betrothal to Sansa Stark in favor of Margaery Tyrell. Sansa is soon compelled to marry Tyrion Lannister to enable Lannister control of the North and to foil a Tyrell plot to marry her to Willas Tyrell and claim the North themselves. However Tyrion refuses to consummate the marriage against her will. Margaery and Joffrey's wedding is held as planned, but during the ensuing festivities, King Joffrey is poisoned and dies. Tyrion is accused of the murder by his sister Cersei Lannister and placed on trial. Sansa is smuggled out of the castle by the jester Dontos Hollard, and taken to Lord Petyr "Littlefinger" Baelish, who has Dontos killed and admits culpability in Joffrey's death and Tyrion's framing, incriminating Margaery's grandmother Olenna Tyrell as well. Littlefinger and Sansa depart King's Landing for the Eyrie, Littlefinger scheming to marry Catelyn's sister Lysa Arryn with the blessing of the Small Council to gain the support of House Arryn. Jaime and Brienne reach King's Landing to find that Joffrey's younger brother Tommen Baratheon will inherit the throne; Tyrion is on trial; and the Tyrell bannermen blame Brienne for Renly Baratheon's death. Jaime's severed right hand becomes infected, but he is healed by former maester Qyburn, who was thrown out of the Citadel for forbidden experiments, earning Qyburn the admiration of Cersei. Jaime refuses to believe that Tyrion killed Joffrey, rejects Cersei's advances, and becomes Lord Commander of the Kingsguard, but refuses his father's offer of Casterly Rock, whereupon Tywin disinherits him. Jaime frees Brienne and gives her a sword reforged from Ice, Ned Stark's sword. He tells her to keep her oath to Catelyn, to find Arya and Sansa and return them home. Against Tyrion, Cersei recruits the spymaster Varys and Tyrion's lover, Shae. Tyrion is approached by Prince Oberyn Martell of Dorne, who offers a trial by combat against Cersei's champion, Gregor Clegane, who he knows was responsible for the death of his sister Elia. Oberyn nearly emerges victorious, but is ultimately killed by Gregor, although the poison on Oberyn's spear leaves Gregor dying in agony. Tyrion is again condemned to death but is freed by Jaime and Varys. Jaime reveals that Tyrion's first wife Tysha, who Tywin had gang-raped by his garrison and forced Tyrion to participate, was not a prostitute as Tywin told him, and genuinely loved Tyrion. Outraged, Tyrion swears revenge on Jaime, Cersei, and Tywin, and tells Jaime he murdered Joffrey and that Cersei took other lovers while he was Robb Stark's captive. During Tyrion's escape, he strangles Shae and kills Tywin in his privy before fleeing Westeros. At the Eyrie, Littlefinger and Lysa are married, and Sansa remains hidden by pretending to be an illegitimate daughter of Littlefinger's, named Alayne Stone. Lysa reveals that Littlefinger had convinced her to poison Jon Arryn, her late husband, to prevent her son from being fostered to Stannis Baratheon, and to write to Catelyn that Arryn had been poisoned by the Lannisters, which was the catalyst for the events of A Game of Thrones. Lysa threatens to kill Sansa, thinking she is trying to seduce Littlefinger, but Littlefinger intervenes and, after revealing that he had only ever loved Catelyn, pushes Lysa to her death. The detachment of the Night's Watch under Lord Commander Jeor Mormont awaits word from Qhorin Halfhand and Jon Snow at their forward base. The Watch are attacked by undead wights and the Others, suffering heavy casualties; but Samwell Tarly kills one of the Others with a blade of dragonglass. At Craster's Keep, some of the Watch mutiny and kill Mormont and Craster, but Sam escapes with the help of one of Craster's daughter-wives, Gilly, and they and the girl's newborn child approach the Wall, assisted by a strange figure riding an elk, whom Sam calls Coldhands. Among the dead are most of the Watch's senior leadership. Daenerys discovers two traitors in her camp: Ser Jorah Mormont, who had spied on her for Varys, informant to the late King Robert Baratheon, in exchange for a royal pardon; and Arstan Whitebeard, an alias of Ser Barristan Selmy, the humiliated former Lord Commander of Robert Baratheon's Kingsguard. Daenerys offers both men the chance to make amends by sneaking into Meereen to free the slaves and start an uprising. Meereen soon falls and, in retaliation for the murdered child slaves, Daenerys has the city's rulers put to death. Selmy asks for Daenerys' forgiveness and becomes Lord Commander of her Queensguard while Jorah, who refuses to admit any wrong, is banished. When Daenerys learns that the council she left in Astapor has been overthrown, she decides to rule Meereen to practice for the rule of Westeros. The tale is told through the eyes of ten main characters, plus a one-off prologue POV and a one-off epilogue POV character, for a total of 12 narrators. Epilogue: Merrett Frey, a member of the numerous Frey family. On October 6, 2009, Martin noted on his blog that his manuscript for A Storm of Swords had been 1521 pages in length; the initial printed hardcover came in at 992 pages. Martin did not write the Red Wedding chapters until he had completed every other chapter of the book, as he felt it was "the hardest thing I ever wrote" and that he would rather delay writing until absolutely necessary. In contrast, he referred to the chapter of Joffrey's fatal wedding as "easy and fun to write" but that he nevertheless tried to instill empathy for the painful demise of this very unpopular character and "bring home the point that this, too, was a human being who was scared and terrified and then dead". Bulgarian: Бард: "Вихър от Мечове"
Catalan: Alfaguara: "Tempesta d'espases" "Storm of swords"
Chinese: 重庆出版社(2007): "冰雨的风暴" ("Storm of Freezing Rain"). German: Single volume, Fantasy Productions (2005): "Schwertgewitter" ("Sword Storm"). Two volumes, Blanvalet (2001, 2002): "Sturm der Schwerter", "Die Königin der Drachen" ("Storm of Swords", "The Queen of Dragons"). Italian: Three volumes, Arnoldo Mondadori Editore (2002, 2003, 2004): "Tempesta di spade", "I fiumi della guerra", "Il Portale delle Tenebre" ("A Storm of Swords", "The Rivers of War", "The Gate of Darkness"). Lithuanian: Alma Littera "Kardų audra" ("A Storm of Swords"). Norwegian: Two volumes, Vendetta (2013): "Stål og snø: en sang om is og ild, bok 3, del 1", "Blod og Gull: en sang om is og ild, bok 3, del 2" ("Steel and Snow: A Song of Ice and Fire, book 3, part 1, Blood and Gold: A Song of Ice and Fire, book 3, part 2)"
Russian: AST: "Буря мечей" ("Storm of Swords"). Spanish: Two volumes, Gilgamesh (2005): "Tormenta de espadas I", "Tormenta de espadas II" ("Storm of Swords I", "Storm of Swords II"). Publishers Weekly said the third volume was "one of the more rewarding examples of gigantism in contemporary fantasy. [...] The complexity of characters such as Daenerys, Arya and the Kingslayer will keep readers turning even the vast number of pages contained in this volume, for the author, like Tolkien or Jordan, makes us care about their fates. Those two fantasy greats are also evoked by Martin's ability to convey such sensual experiences as the heat of wildfire, the chill of ice, the smell of the sea and the sheer gargantuan indigestibility of the medieval banquet at its most excessive. Perhaps this saga doesn't go as far beyond the previous bounds of high fantasy as some claim, but for most readers it certainly goes far enough to command their attention." Martin was nominated for the 2001 Hugo Award for Best Novel, but lost to J. K. Rowling for Harry Potter and the Goblet of Fire. Afterwards he made this comment about his fans: "Eat your heart out, Rowling. Maybe you have billions of dollars and my Hugo, but you don't have readers like these." ^ Miller, Faren (November 2000). "Locu Online Reviews: A Storm of Swords (August 2000)". Locus. LocusMag.com. Retrieved March 7, 2010. ^ a b c d e f g "2001 Award Winners & Nominees". Worlds Without End. Retrieved 2009-07-25. ^ a b "2001 Hugo Awards". The Hugo Awards. 2001-09-03. Archived from the original on 2012-04-19. Retrieved 2011-10-13. ^ Martin, George R. R. (11 April 2012). "Season Three". Archived from the original on 14 April 2012. Retrieved 11 April 2012. ^ Elavsky, Cindy (January 19, 2014). "Celebrity Extra". King Features. Retrieved April 22, 2014. ^ Martin, George R. R. (October 6, 2009). "Not A Blog: Dance, Dance, Dance". GRRM.Livejournal.com (Author's LiveJournal blog). Archived from the original on December 28, 2009. Retrieved March 4, 2010. ^ Product Details: A Storm of Swords (2000). Amazon.com. ISBN 0553106635. ^ "The Citadel: So Spake Martin - To Be Continued (Chicago, IL; May 6–8)". Westeros.org. 2005-05-06. Retrieved 2011-10-13. ^ "Fiction review: A Storm of Swords". publishersweekly.com. October 30, 2000. Retrieved 2012-02-13. "The Way of Cross and Dragon"
"The Last Defender of Camelot"
"The Once and Future King"